The Xiaomi Redmi Note 7 with a 48MP rear camera goes on sale today in China. We are comparing the phone with the RealMe U1 to know which device packs better hardware under its hood? The Xiaomi Redmi Note 7 has been introduced in China last week. The phone is all set to go on sale in the country today. The device is launched in three variants 3GB/32GB, 4GB/64GB, and 6GB/64GB storage models. The base variant of the device is starting from Yuan 999, which roughly translates into Rs 10,000 appx. On the other hand, we have the RealMe U1, which is the first selfie-centric smartphone by the company. It has a 25MP AI-powered selfie camera and a dual camera set up at the back. Let’s do a quick specifications comparison of the two to know which device is the best when it comes to hardware at least on paper. 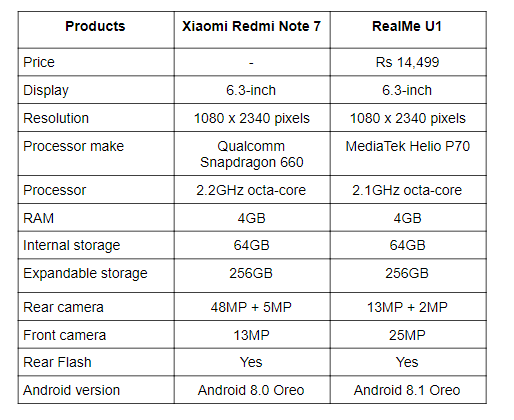 Both RealMe U1 and the Xiaomi Redmi Note 7 sports a 6.3-inch display that offers a resolution of 2340 x 1080 pixels. There is a water-drop notch on top of both smartphones that gives you more viewing area. When it comes to the processor, the Xiaomi Redmi Note 7 is powered by Qualcomm Snapdragon 660 processor, which is paired with 4GB RAM and 64GB internal memory that is expandable to up to 256GB via a microSD card. On the other hand, the RealMe U1 is backed by a MediaTek Helio P70 chipset that is coupled with 4GB RAM and 64GB internal memory. Coming to the cameras, one of the main highlights of the Xiaomi Redmi Note 7 is its 48MP rear camera, which is accompanied by a 5MP depth sensor. At the front, the phone has a 16MP unit. On the other hand, the RealMe selfie centric device “U1” has a 25MP AI-powered selfie-camera and a dual 13MP + 2MP rear cameras. 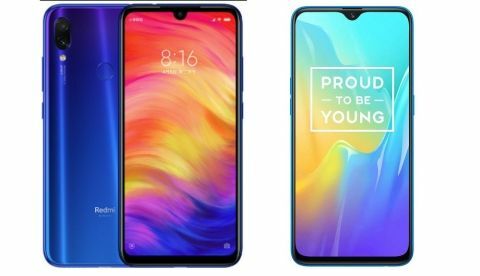 The RealMe U1 is starting from Rs 11,999 in India, while the Xiaomi Redmi Note 7 is launched in China at Yuan 999 (Rs 10,000 appx). However, the phone has not yet launched in India but expected to make its debut here very soon.